Seven Psychopaths is another one of those movies where lots of characters talk too much. Martin McDonagh’s film tells the whacked-out story of Marty (Colin Farrell), a Los Angeles screenwriter, and his buddy Billy (Sam Rockwell), a dog “borrower” (he takes the mutts, then returns them days later so he can collect the reward), who cross paths with a mobster (Woody Harrelson) when Billy dognaps his pooch. But it’s not so much about the story as much as it is about letting a quirky cast spout the kind of dialogue you typically only hear in Tarantino films. This cool neo-noir, which gets its title from the film Marty is writing, begins with a scene where two hit men (played by Michael Stuhlbarg and Michael Pitt) are discussing shooting people in the eye and killing women, among other topics, in a completely oblivious, matter-of-fact way. These guys are standing there right in broad daylight, with their own guns, just talking away, and they get taken out from behind by the first of the seven titular psychos — and he’s wearing a mask! It’s a ridiculous scene, comedy punctuated by violence, and it’s an effective introduction to the type of offbeat sensibility McDonagh has. Seven Psychopaths goes back and forth between the film’s reality and the stories of psychos and killers Marty is incorporating into his screenplay (including one where Harry Dean Stanton plays a killer Quaker). 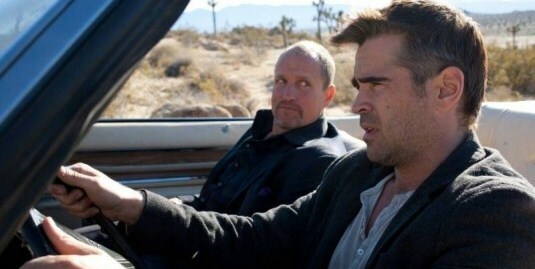 In another film, the whole thing might be one of those tall tales, but Seven Psychopaths isn’t that predictable. Instead, the story is amped up by Billy, an aspiring writer/actor who thinks he’s part of a movie, and has planned the dognapping to end a certain way. (In the desert, natch.) And it just gets crazier and crazier. Just go along for the ride. McDonagh sets up the scenarios and lets his cast do the rest, and they all deliver note-perfect performances. Farrell holds down the serious center of the film, letting folks like Tom Waits and Rockwell be their amusingly whacked-out selves. Sure, Christopher Walken goes a little into self-parody, but his unique way of reading a line is always fun to watch. There’s a truly balls-out potential climax set in a cemetery that involves aspects of horror and gangster movies to an excessive degree, and that’s good for a few laughs. (Watching Walken in particular is a hoot.) But McDonagh’s created something self-referential enough that it knows not to descend into such cheesy action for real. Instead, this delightfully off-kilter film keeps us guessing and laughing, never taking a predictable path. 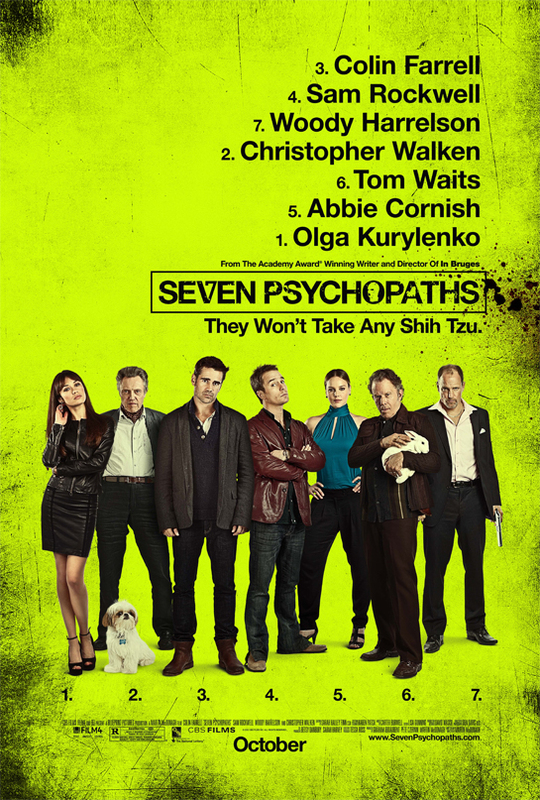 For that reason among others, I’m giving Seven Psychopaths a B+.